Batman is surprised by the return of Inque. In their last show meeting her liquid form had destabilized, but now she seems to be back in form. This is due to implants put into her by a scientist who is now forcing her to steal important research. Later he sends her to kill the creator of that research but Batman stops her, Inque asking for help. Thanks to a piece of Inque left behind Batman is able to track her down and defeat the scientist. With the implants offline Inque returns to her goopy state but manages to get away by attaching her self like a costume to a normal human. She’ll be back. What they got right: Remembering the continuity of the show and finding a way to tell a story without breaking it. The show had their own plans for Inque but if she was fully restored here that would get in the way. They worked around that and the story is better off for it. Bruce and Terry both show their cleverness during the story. What they got wrong: I actually don’t have any complaints. Other notes: This wasn’t the end for the tie-in comic…which is good considering the more recent Batman Beyond comics. I’d be sad if that was the only representation of the show we ended up with. An ongoing series was launched after this, ended when the show did like the other DCAU tie-ins. We’ll start with the ongoing soon, when it pops up in my collection. Recommendation: The miniseries was rather good, very much keeping to the style of the show, unlike stories that came later. (Long time readers already know my gripes.) Avoid that miniseries and pick up this one. Also watch the show. 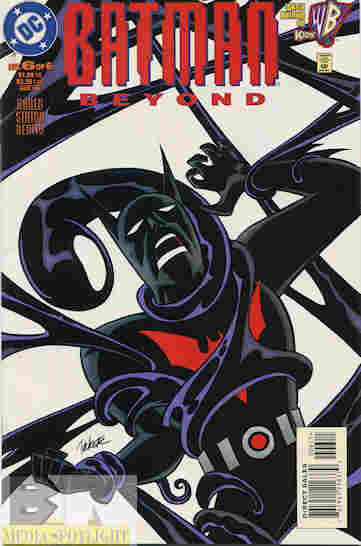 Posted by ShadowWing Tronix on June 30, 2018 in Animation Spotlight, DC Spotlight, Television Spotlight, Yesterday's Comics and tagged Batman Beyond, Inque, Terry McGinnis.